All of our local Roo Girls know we love to be a part of our southern New Jersey community. 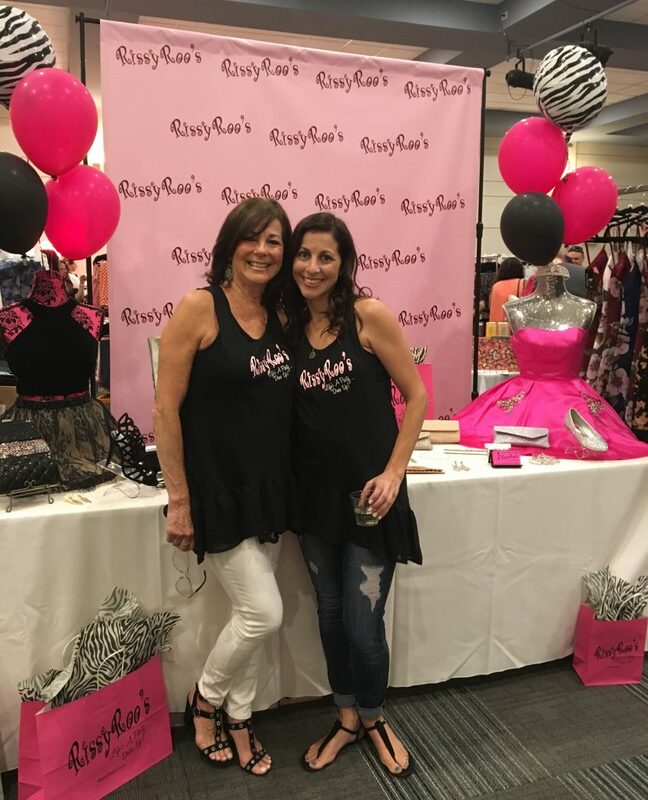 The latest in community fun came last week, on Wednesday, July 12th, when Rissy Roo's attended as the Fashion Sponsor at the JCC of Atlantic County's Sip & Shop Ladies' Night Out Shopping & Wine Tasting Event. The special one-night Sip & Shop event was for a great cause, to help JCC facilitate sensory play in their early childhood education classrooms. All proceeds from the 2017 Sip & Shop Ladies Night Out went to support the effort to enhance the sensory centers in each of JCC's preschool classrooms. The purpose of the sensory centers is for children to learn important skills, including math, science, physical development, and social and emotional skills. Over $4,800 was raised for the early childhood education center classrooms, and it was such a fun community event that brought together both local vendors and national vendors, who traveled in for the special event. Other than Rissy Roo's attending as the Fashion Sponsor, Salon Kink was also a sponsor of the event. They styled the hair on all of our Roo Girl models at the event, and even did the makeup for our Roo Girl Juli! 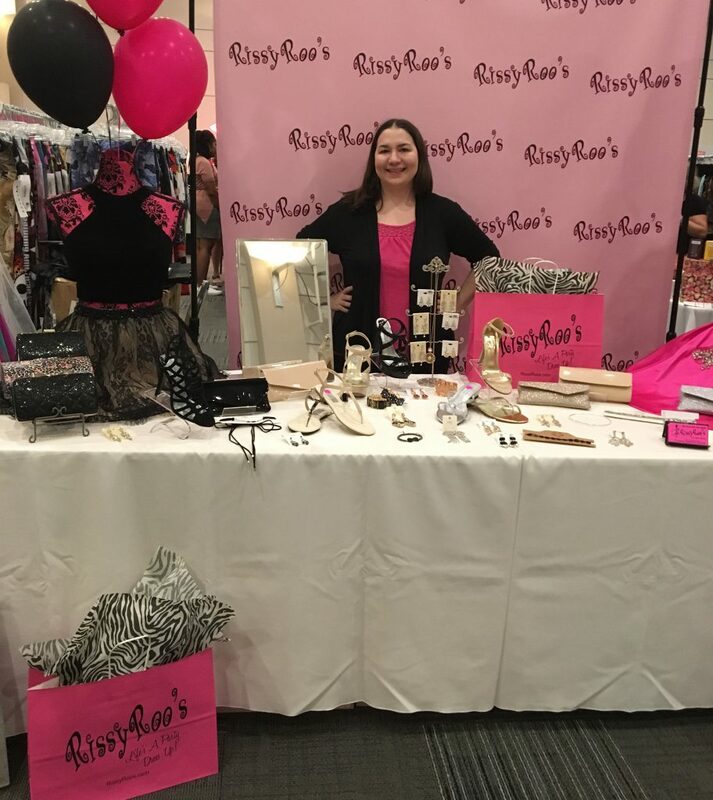 Thirty six vendors were present in total, including Lululemon Athletica, Aearance Dermatology, Arbonne, BathFitter, Bocca, Brace Urcelf, Cutco, Embellish, Hope Jewel, India Hicks, Le Fashion Cottage, Lularoe, Lusciously Scented, Marilyn Chackman, Mary Kay, Messed & Distressed, Monat, NuSkin, Paper Chase, Pendant of Light, Perfectly Posh, Premier Designs Jewelers, Psychic Answers, Pure Romance, RetroChic Beauty, Sabai Soap, Stella & Dot, Sugar on Topp, LLC, Tara Bella, Traveling Jewels, Usborne Books and More, Wildtree, Younique, and 3 Girls Gifts. Bocca may have been one of our favorite vendors because they provided delicious pizzas and appetizers for everyone! 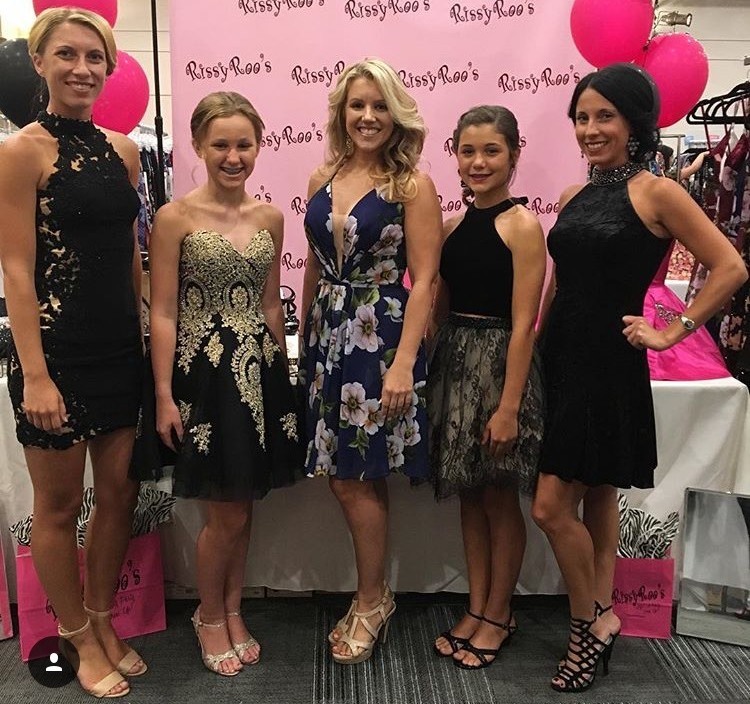 This entry was posted in For Fun, In The News and tagged Homecoming Dresses, Roo's News, Homecoming dress, In The News, Homecoming, event, news, current events, Homecoming 2017 on July 19, 2017 by Chrissy Roos. With summer coming to an end, that means it's time to get ready to go back to school. Of course, back to school also means celebrating homecoming. Homecoming is a fall tradition and rite of passage for high school students. While the festivities vary from community to community, most homecoming activities include a formal or semi-formal dance. For the ladies, this is an ideal opportunity to get dressed up. For this year, we love the idea of a classic black dress. This look is simple and looks great on pretty much everyone. Also, unlike a lot of other homecoming dresses, you can always wear a black dress again. By adding different accessories to a black dress, you can make an entirely new outfit. Of course, with a big event like a homecoming, it's natural to worry that a black dress would be too simple. But it's all about how you style it. Black homecoming dresses can be easily enhanced with a variety of accessories. Here are favorite ways to style your black dress for this year's homecoming. One easy way to accessorize your black dress is with some beautiful jewelry. This can liven up your look by adding some color and shine. For instance, a large statement necklace can make black homecoming dresses with a simple neckline more interesting. A necklace with chunky, brightly colored stones can create a dramatic effect. Or, for something more classic, you could choose a necklace with a thin chain and an elegant pendant. Another choice for jewelry is a pair of big and bold earrings. Both long, dangly earrings and large hoops can help draw attention to the face. Or, you can try some large studs, for a unique look. We also love bracelets with black homecoming dresses. You can either wear a single, large bangle or try stacking multiple smaller bracelets. The latter choice will add more variety to your outfit. An easy way to add color to your outfit when wearing a solid black dress is by pairing it with brightly colored shoes. Since the dress itself is simple, you can take risks by choosing more elaborate and creative shoes. For instance, you could wear heels in a bold color like red or turquoise. Or, you could go for something more unique, like an animal print. Choosing an interesting material, like leather or velvet, can also make your outfit more interesting. Don't forget that heels aren't your only choice for formal shoes. A pair of fun flats can be just as effective in adding an interesting touch to your dress. We especially love the idea of flats that include a buckle, or a gem. Typically, homecoming in celebrated in the fall. Depending on where you live, it might be chilly out. Luckily, adding layers to black homecoming dresses will both keep you warm, and add to your style. You could choose tights that add a different color, pattern, or texture to your outfit. For instance, lace tights are a great way to make your style more formal. By contrast, patterned tights with interesting shapes will add variation and complexity. A jacket or sweater is another multi-purpose layer you can add to your dress. We love the idea of a blazer with shortened sleeves. Also, blazers and sweaters are a particularly good option because you can always remove them during the course of the night. For a loose-fitting dress, a belt or a sash can help draw attention to your waist and show off your figure. A brightly colored or glittery piece will be particularly striking. When you're putting your outfit together, remember to consider how you want to do your hair and makeup. The style you choose will make your outfit more or less sophisticated, depending on the look you're going for. For something simple, you can wear your hair down, in loose curls. You can also use a volumizing spray to add depth to your hair. Hair accessories are a great way to step up your look. A hair band or a large barrette will look feminine, and add an interesting touch. It will also help draw attention to your face. For makeup, we love the idea of choosing a bright red lipstick. The vibrancy of this color contrasts nicely with black homecoming dresses. Finally, whenever you're putting an outfit together, it's important to consider your bag. Your bag is more than a functional piece to carry your belongings. It's also an important accessory that can add to the overall style of your outfit. Depending on what kind of look you're going for, there are different handbag choices to add to your black homecoming dress. For instance, a cross-body bag creates a daring look. Choosing a bag in a contrasting color will make your style look more complex. That said, while we love the look of a bag with a strap, it's not necessarily the most formal choice. But, if you are going for something a little more casual, a cross-body bag works perfectly. For a truly formal look, the best choice is an elegant clutch. Remember that one of the best features of a black dress is its simplicity. The "little black dress" is a classic look, and it's easy to elevate with fun accessories. But keep in mind that you shouldn't overdo it with the accessories. Adding too many pieces to the dress can defeat the purpose of choosing a simple dress in the first place. For this reason, we recommend choosing one or two statement pieces. For instance, if you decide to wear a statement necklace, then you should choose simple earrings. Similarly, if you wear fun shoes, make sure to carry a simple bag. These choices will bring balance to your outfit. What's your favorite way to style black homecoming dresses? Let us know in the comments! This entry was posted in Uncategorized on July 17, 2017 by Special Contributor. The 2017 Radio Disney Music Awards were held on April 29th at the Microsoft Theater in Los Angeles, with so many of Disney's most celebrated celebrities in attendance. With the celebs dressed in their best, of course, some of our favorite dress designers could be found on the red carpet. One of those designers was Johnathan Kayne! 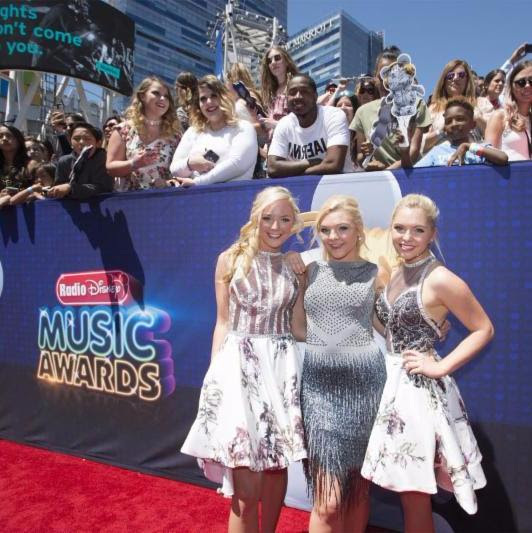 The trio of sisters Southern Halo rocked the red carpet in Johnathan Kayne, and looked so gorgeous. This entry was posted in Celebrities, Best Dressed, In The News, Fall and tagged Cocktail Dresses, Red Carpet, celebrities, celebrity, Best Dressed, Disney, Best Dressed Celebrities, Celebrity Inspired Dresses, Red Carpet Fashion, Celeb Style, cocktail dress, celebrity style, Celebrity Fashion, celebrity dresses, fall, music, jonathan kayne, red carpets, Tallyraps, Fall 2017 on July 14, 2017 by Chrissy Roos. Summer weddings are the best time for pastel colors, bright patterns, and for showing off skin. But if you're attending a wedding this October or November, you may be wondering what to wear to a fall wedding. Fall weddings are exceptionally beautiful, and if you're invited to one, feel excited! The crisp air and the deep, warm colors of autumn will make for an evening you'll never forget. Want to make it even more special? If you're attending a wedding this fall, plan on hanging up your go-to summer dress and sandal heels. Rise to the occasion for the fall wedding season and be the best dressed by far! Here's what to wear to a fall wedding...! This entry was posted in Weddings, Fall on July 3, 2017 by Special Contributor. "Thanks to the young lady that helped me find this dress for my princess Mikhaela! She and Braxton stunned at their Senior Prom. My sales rep was so awesome and she went beyond her job to find this dress for me! She called back numerous times to help me and that's why I ordered the dress from you instead of another location in Florida!!!! I am forever grateful for her! I cannot remember her name but she ROCKS!!!!... please send my thanks." Below is a picture of Mikhaela and her mom, Danyelle, both looking so beautiful together. Mikhaela is from Cartersville, GA and attended the Cass High Senior Prom this past April with her prom date Braxton. The couple certainly couldn't have looked any cuter together! 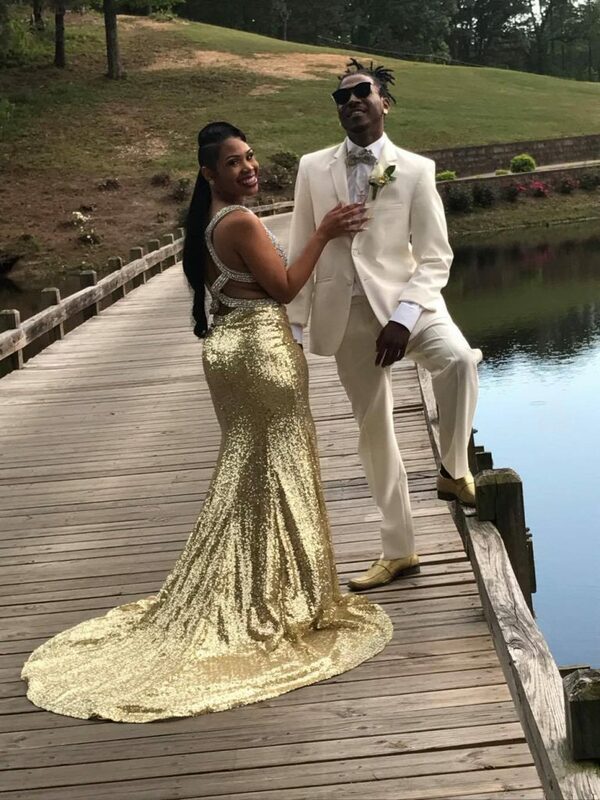 We loved Mikhaela's golden sparkly dress paired with her date's white tuxedo - such a perfect combination. Oh, and did you catch Braxton's shiny gold shoes? The couple certainly knew how to bring the style to prom. Mikhaela topped off her prom look with sparkly gold eye makeup and nails, gold earrings, and a bold purple lipstick. Want to see more of Mikhaela's beautiful dress and overall look? Check out the video below for the full 360 view! 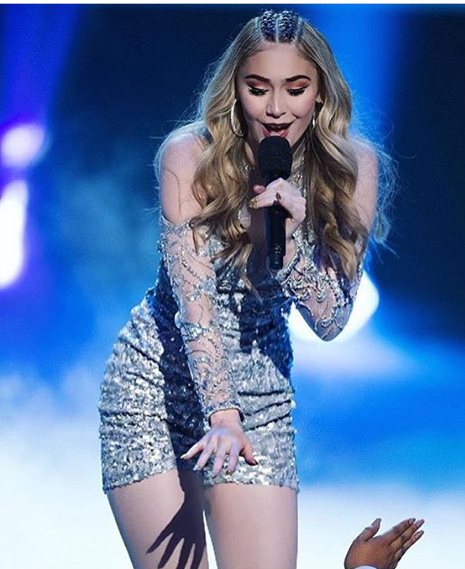 If you love Mikhaela's look, make sure to check out all of our gold dresses for a sparkly look for your next event, whether prom, graduation, a summer wedding, or any other type of party. From floor-length cut-out gowns like Mikhaela's to short and sassy numbers, there are plenty of glittery gold dresses to choose from. We're so happy that you had an incredible time at your Senior Prom, Mikhaela, and that you loved your dress! Congratulations and good luck with graduation! This entry was posted in Testimonials, Prom Dresses, Video and tagged Prom Dresses, Prom, Prom dress, testimonial, Prom Dress Testimonial, Prom 2017 on June 7, 2017 by Chrissy Roos. Promposals, also known as "prom proposals," have always been a tradition that accompanied the annual high school celebration. 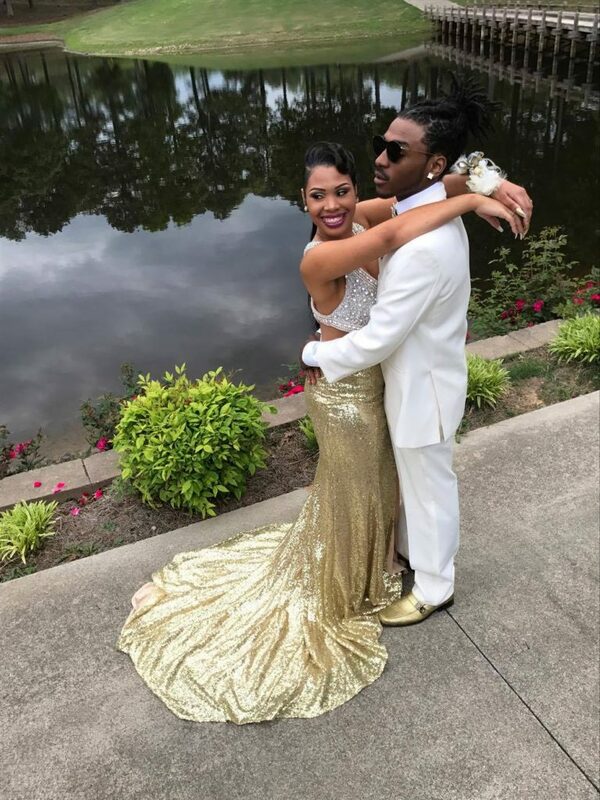 The ritual of inviting your date to prom in a unique, fun, romantic, or intricate way has certainly gained in popularity with each passing year. These promposals have, undoubtedly, become more and more elaborate with each new prom season. We've written many blog posts and posted many pictures on our Facebook page of promposals we love, and thought it was time to pick out our top 20 promposals for the season. Check them out below for a comprehensive list of some great promposal ideas! 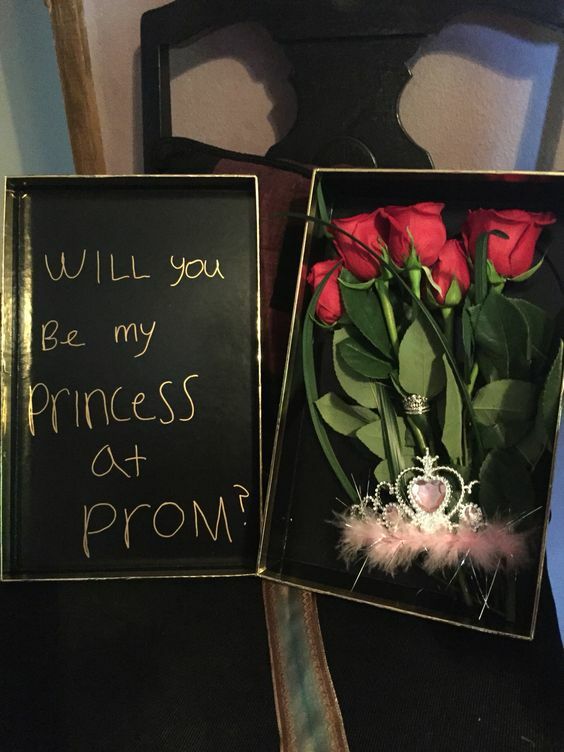 From simple to intricate and funny to romantic, there's a prom proposal idea for everyone. Make sure to read all the way through for our very favorite promposal. 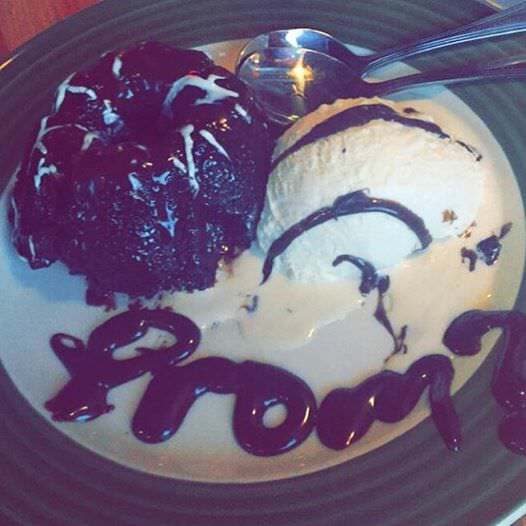 A promposal can be as simple, yet still romantic, as just taking your date out to a nice dinner, or make dinner yourself, and have the question incorporated into the desert. Like in the promposal above, just a simple, "prom?" is needed. We especially love this chocolate cake promposal because it came from one of our very own Roo Girls! Have some creative and artistic skills you're looking to put to use? We love this cute use of car fresheners to create a funny promposal idea! It's a great way to keep the promposal simple and light-hearted. 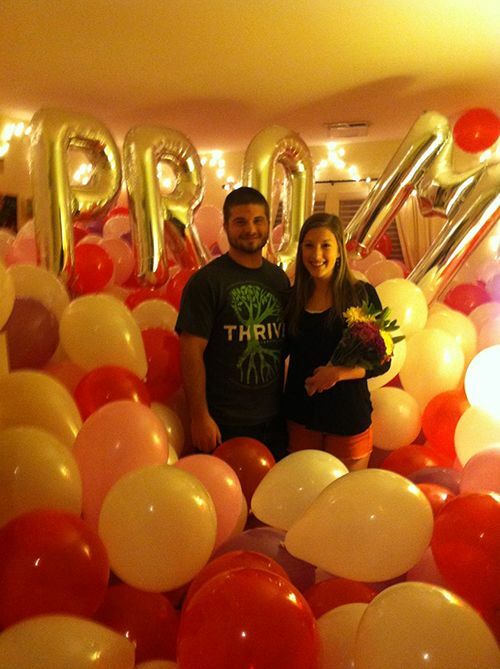 For a super simple, yet totally cute, promposal, just get lots and lots of balloons! It's sure to put a big smile on your date's face. 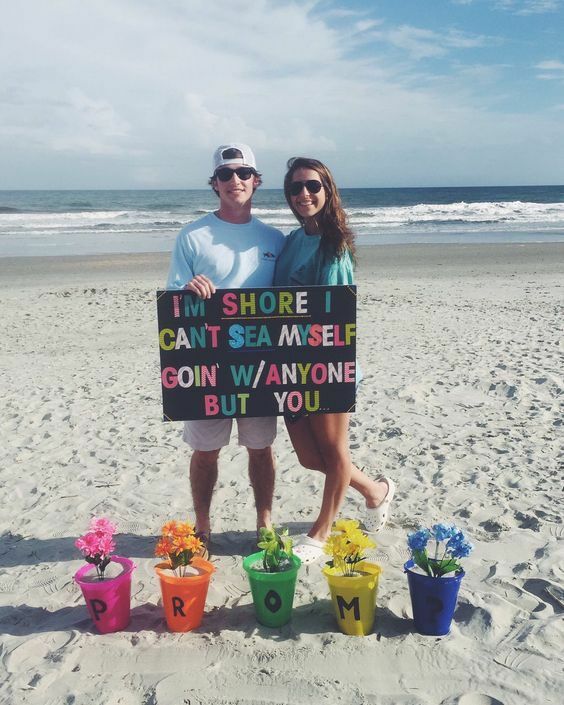 With the warm weather finally here, what could be more fun than a promposal on the beach? Just don't wait too long for the weather to be perfect enough to hit the beach, so that there's still plenty of time to plan before prom comes. For a classic romantic idea, make your date feel like a princess with a bouquet of roses, a princess crown, and a cute message. It's just that easy! 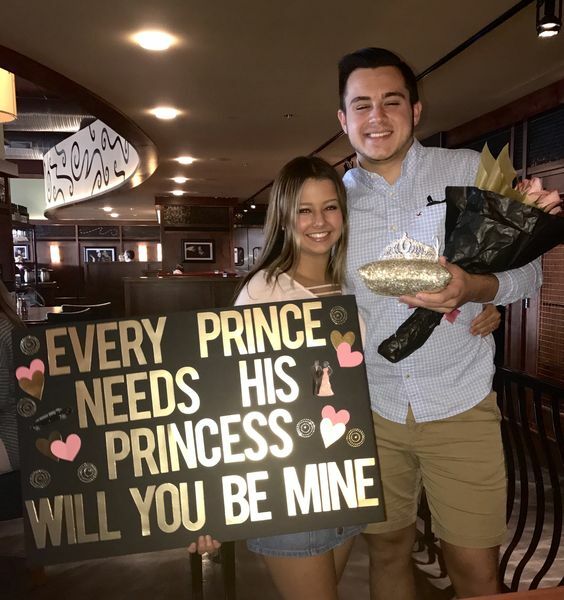 This promposal is very similar to the one before it, but we love how they brought the idea to a new level with the cute message, "Every prince needs his princess... will you be mine?" It's definitely a romantic way to ask your date to prom! Using food for your prom proposal is one of the easiest, light-hearted, cute, and funny ways to pull off the big ask. Plus, it's a great way to keep the rest of the night low-key with some food to chomp on. You'll see lots more food promposal ideas throughout this post, so read on for many more cute ideas. Does your date love tacos even more than chicken nuggets? 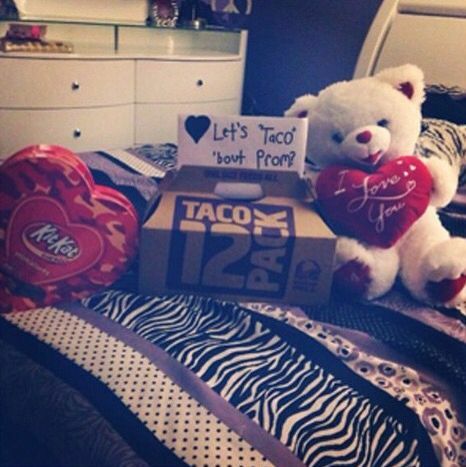 Get a Taco Bell 12 pack, and make a note with the cute message, "Lets 'taco' 'bout prom." It doesn't get much easier than that for a prom proposal! If you know someone who works at a Taco Bell, take this idea to the next level by having the promposal displayed for all to see on the store's signage, like this promposal. Seeing a trend yet? Pairing food and a cute message is such an easy and fun way to pull together a promposal. 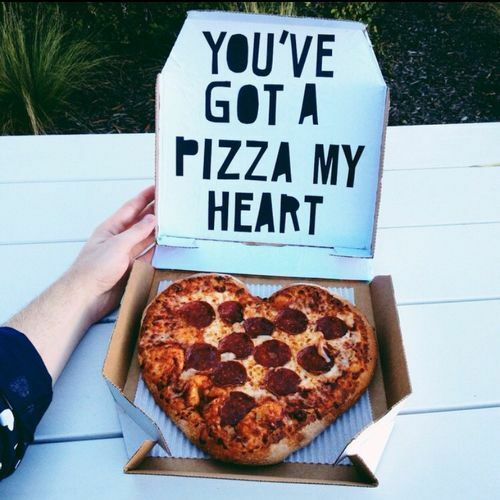 Grab a pizza, or make one yourself like this heart-shaped pizza, and add a cute message like "you've got a pizza my heart" or "I know this is cheesy, but...prom?" 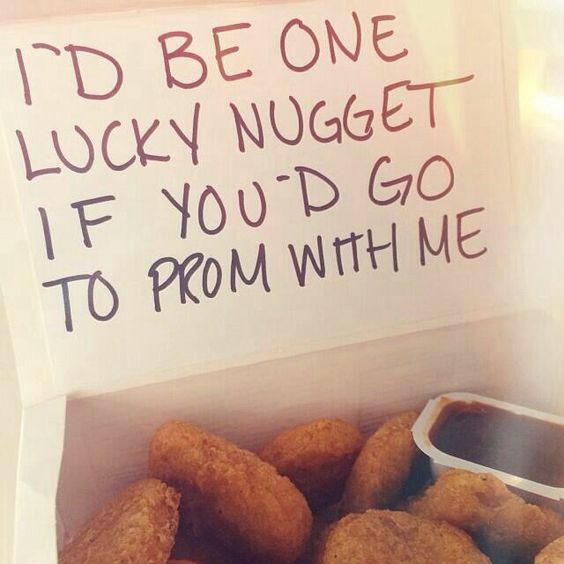 for a prom proposal idea that anyone will want to eat up. We're giving this pizza promposal extra props for being in the share of a heart. We're not done with the food or cute slogan promposals yet! Next up is this cute cookie cake promposal. If you're a baker with an artistic mind, this is such a great idea, especially if your date is an animal lover. 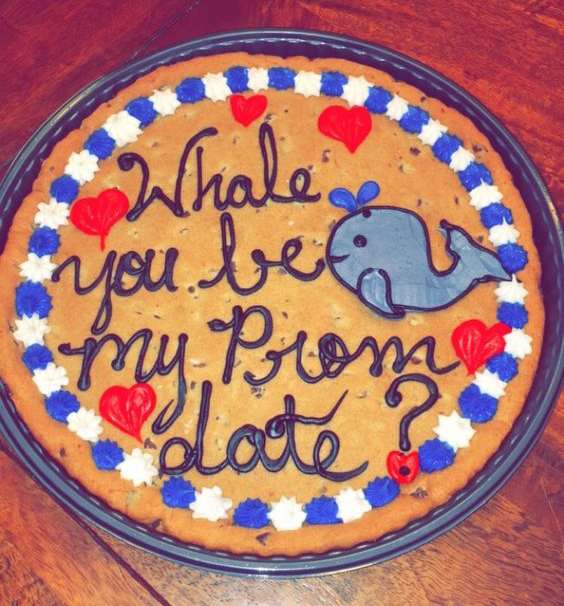 Show off your baking skills by making a yummy cookie cake, adding the slogan, "Whale you be my prom date?" to the top of it for a cute, fun-loving promposal. We had to make this our favorite food promposal because of the clear passion that went into baking something like this! Is your date a big sports player or fan? Find a way to incorporate his or her favorite sport into the promposal. 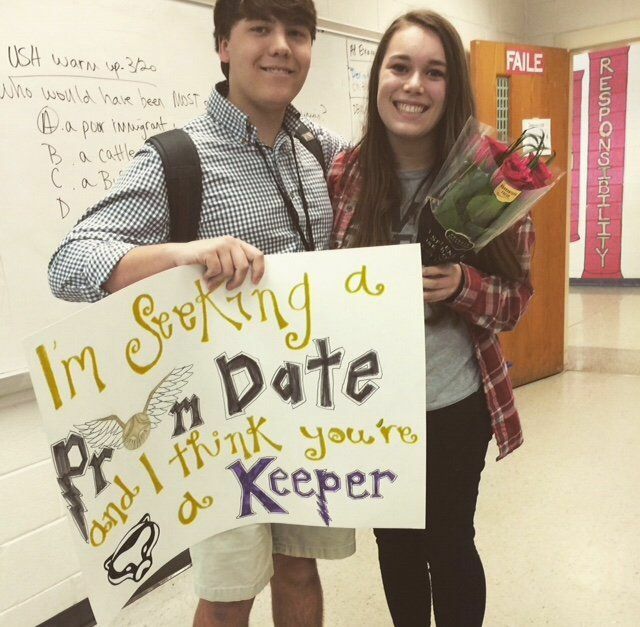 This promposal even found a cute way to incorporate the person's position on the team - the team manager! Top off the cute message with a pretty bouquet of flowers to add a little bit of romance. 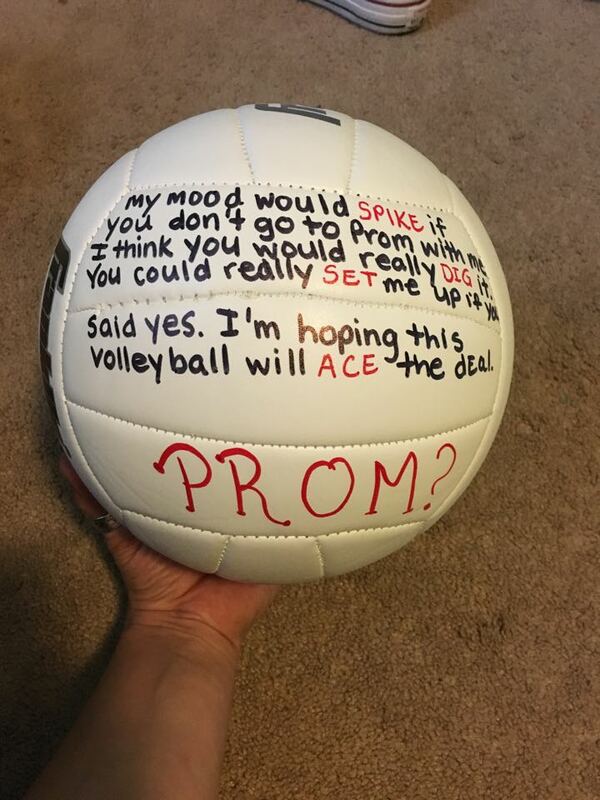 For another sports promposal idea, this volleyball promposal is so creative and sent in from one of our very own Roo Girls! We couldn't be more impressed with the creativity that went into putting this promposal message together. Have a cute pet in your life or in your date's life? Incorporate the lovable creature into your promposal! After all, who can say no to a cute fluffy face like this dog? 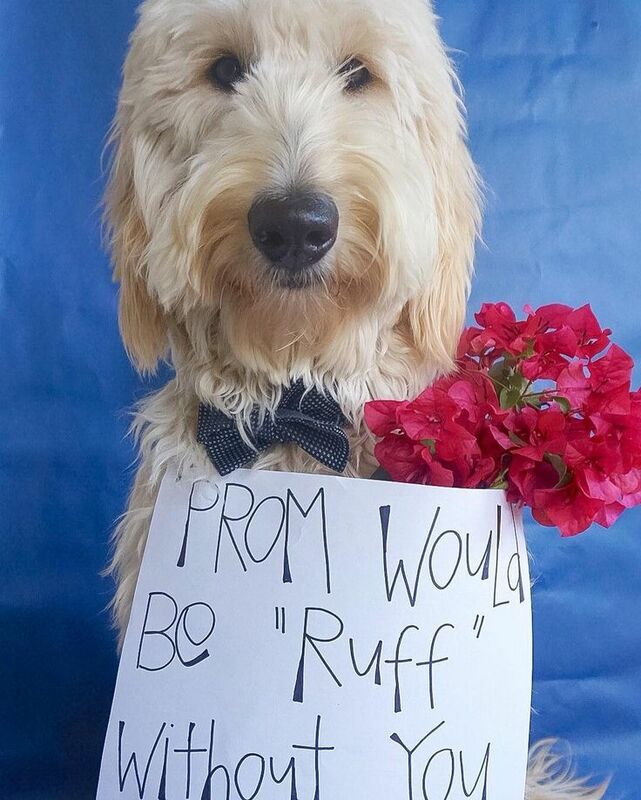 You can create a cute dog themed promposal with a message like, "Prom would be 'ruff' without you." Most pets can be incorporated into a promposal idea, so don't get stuck if there are no dogs around to help out your mission. Have some fish? Use the message, "Out of all the fish in the sea, will you go to prom with me?" Live on a farm and have a goat? The message could be as easy as "praaaam?" Want a really romantic way to ask your date to prom? Find a pretty ring, and include the message "I prom?se." 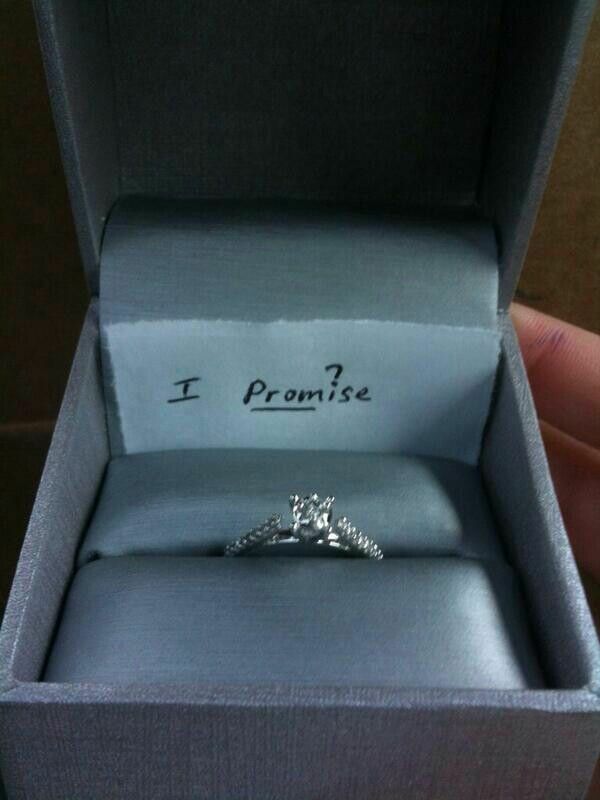 Not only will they get a promposal to remember, but they'll get a promise ring that they can keep forever. 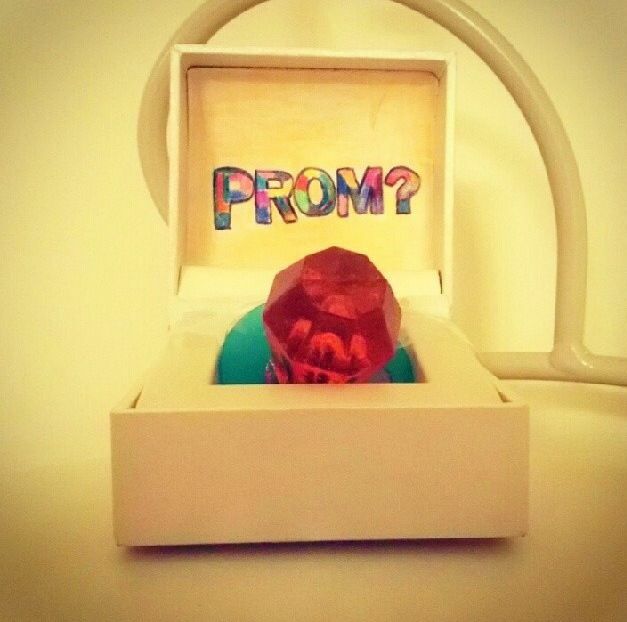 Ask your date to prom with a ring, but keep it light-hearted with a ring pop instead of a real ring! Cute and delicious! Is your date a Harry Potter fan? Find a way to incorporate their favorite book and movie series into the promposal with a cute message like, "I'm seeking a prom date and I think you're a keeper." Your date will think you're super cleaver and pay attention to their interests. Does your date love makeup? Steal their heart with this promposal idea and be the highlight of their prom season and prom night. 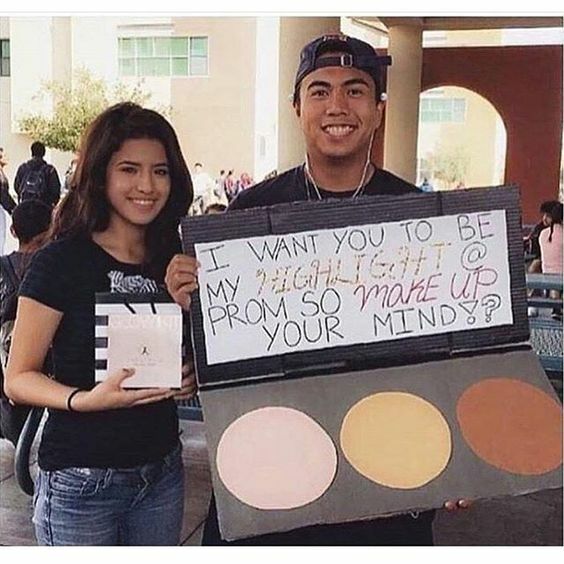 This promposal is in our top 5 because of how unique and creative it is. 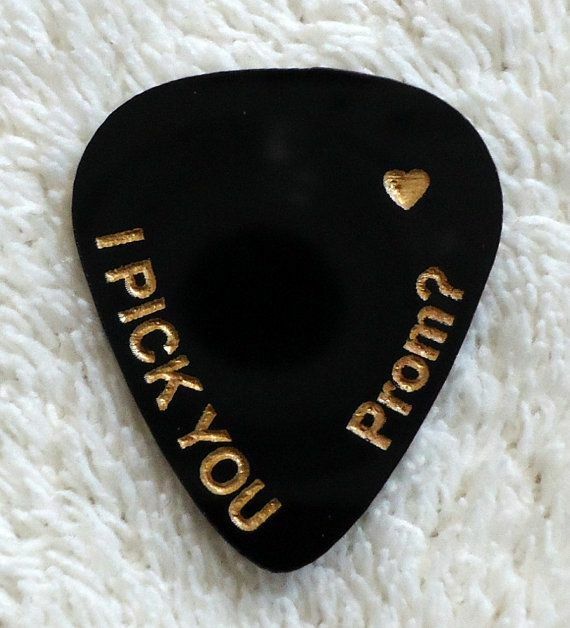 If your date is a guitarist, put together a a special promposal with a personalized guitar pick. Not only will they have a memento to remember the special day, but they'll see how much you care about and pay attention to their personal interests. 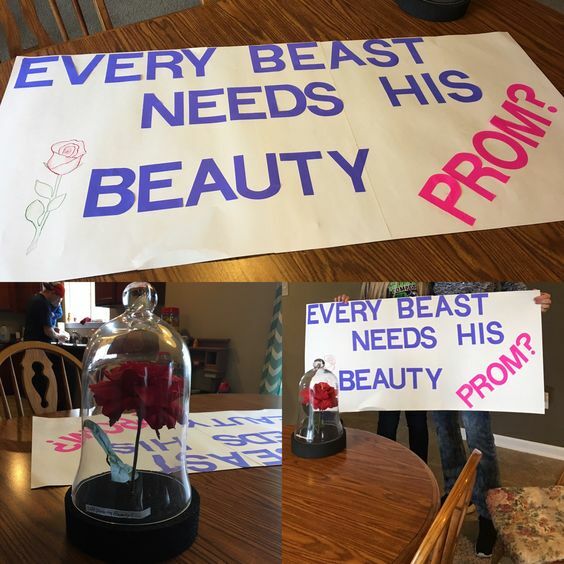 With the new Disney live action Beauty and the Beast movie released in March, what could be more romantic than a Beauty and the Beast promposal? This idea has become popular long before the initial mention of the movie remake, so there's been many different forms of this promposal through the years. The consistent factor throughout all Beauty and the Beast promposals is using the famous rose. We love the version in the image above, and check out this one for another idea. Beauty and the Beast isn't the only classic Disney movie to pull promposal inspiration from. 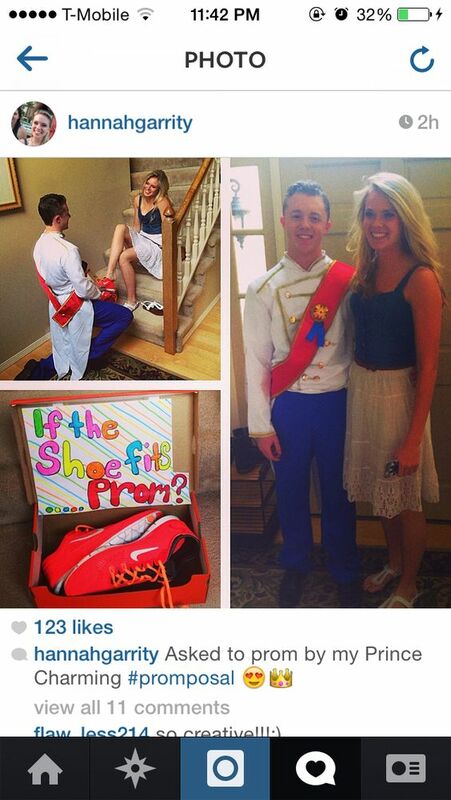 Channel the classic story of Cinderella by asking your date to prom as Prince Charming. Add some amusement to an otherwise more serious and romantic promposal by presenting your date with sneakers rather than heels. You can even take it a step further by getting customized sneakers through NIKEiD! This Prince Charming Promposal takes our number one spot because it hits every just about every emotion: romantic (who doesn't want to be asked by Prince Charming to prom? ), cute (loving those Nike shoes! ), and funny (you must have a good sense of humor to go so far as to dress up as Prince Charming!). However you decide to ask your date to prom, just remember to breathe, relax, and have some fun! This entry was posted in For Fun, Promposals and tagged Prom, promposal ideas, promposals, fun, funny, prom fun, promposal on May 3, 2017 by Chrissy Roos.